Venous insufficiency treatment performed at The Vein and Vascular Institute of Riverview using the latest laser technology has helped thousands of patients improve their overall health and quality of life by stopping the achiness and swelling in their legs. Our Board Certified Vascular Surgeons offer comprehensive diagnosis and treatment of venous insufficiency and all vein diseases in our Nationally Accredited Vascular Laboratory, which is one of only a few in the entire State of Florida. When the valves in your lower leg veins start to weaken and become damaged, blood can leak downwards and start accumulating in the lower leg veins causing swelling and leg pain, which are the first symptoms of venous insufficiency disease. As the blood continues to accumulate over time and the blood becomes stagnant, the chances of developing blood clots and leg ulcers increases. If a blood clot travels to your lungs or to the brain, it can be fatal. And if a leg ulcer is left untreated, it can lead to leg, foot or toe amputation. It is important for your future quality of life, to get venous insufficiency treatment as soon as you start noticing the first warning signs of venous insufficiency because venous insufficiency is a very progressive disease that only gets worse with time. The good news is that venous insufficiency treatment at our state-of-the-art vein center in Riverview, Florida uses minimally invasive laser vein surgery techniques that are extremely effective and innovative, eliminating the need for traditional surgery or staying in the hospital overnight. Our vein treatments offer minimal to no scarring at all for our patients since they are performed without staples or sutures. In fact, our patients are usually able to resume their normal daily activities within one day. 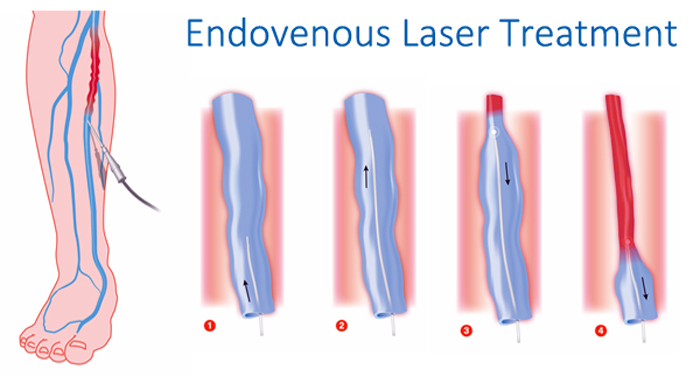 Treatment such as Endovenous Laser Ablation, also known as EVLT (Endovenous Laser Treatment), where the diseased vein is basically sealed shut and destroyed by a laser light, is a low risk procedure and is highly effective at resolving issues related to venous insufficiency. Laser ablation vein treatment is performed right in our office, and usually takes less than an hour. If you want to know what a patient experiences on the day of an EVLT treatment, you can watch the EVLT Treatment Pre-Op Video. It is important to have procedures, such as EVLT, performed by a Board Certified Vascular Surgeon since these types of endovenous procedures require precision and the expertise of a highly skilled and extensively trained vascular surgeon. At The Vein & Vascular Institute of Riverview our vascular surgeons are held to the highest standards and are Board Certified in Vascular Surgery, which means they have to undergo more extensive training. Our vascular surgeons are heavily involved in the vascular surgery industry to ensure that they stay current on all the latest technological advances and advanced surgical techniques related to vein disease. Depending on how advanced your venous insufficiency is, treatment could be as simple as prescribing medication, fitting you with the right compression stockings that will improve your leg circulation or giving you recommendations about lifestyle changes that you can make to help improve your circulation. At The Vein and Vascular Institute of Riverview we are passionate about helping people who suffer from venous insufficiency. Remember that early diagnosis is the best way to prevent venous insufficiency from progressing and causing serious health risks, such as leg ulcers and blood clots. To make an appointment for a vein consultation with one of our Board Certified Vascular Surgeons, give us a call today at (813) 999-3992.